Republicans are far less supportive than Democrats of a strong government role on issues related to the social safety net, but it’s a subject on which the party has notable divisions within its ranks. There are stark socioeconomic differences within the GOP when it comes to issues like poverty, health care and education: Lower-income Republicans are more likely than those with higher incomes to favor a major role for government in these areas. By contrast, large majorities of Democrats – regardless of their family income – support a strong government role in each of these areas. The largest internal GOP differences are over the government’s role on poverty and health care, according to a new Pew Research Center survey on attitudes about government. About half of Republicans and Republican-leaning independents with annual family incomes of less than $30,000 say the federal government should have a major role in helping people get out of poverty (53%) and ensuring access to health care (50%). Among Republicans and Republican leaners with annual incomes of $75,000 or more, just 24% favor a major role for government in helping lift people from poverty, and 20% want it to have a major role in ensuring access to health care. 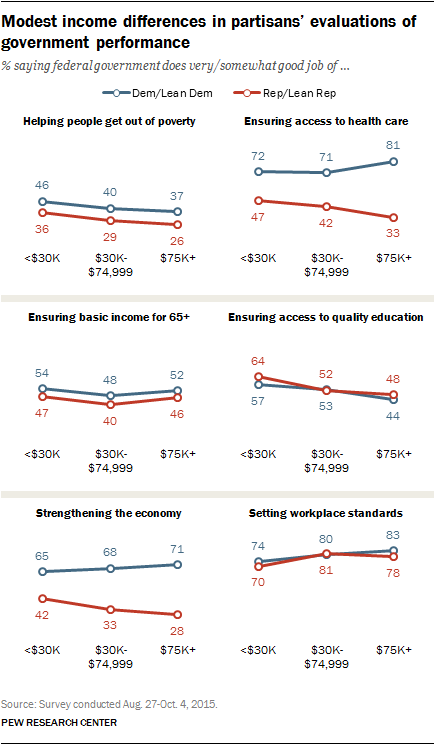 Fully 70% of Republicans with incomes below $30,000 support a major government role in ensuring a basic income for those 65 and older; only about half (48%) of those with incomes of at least $75,000 say the same. 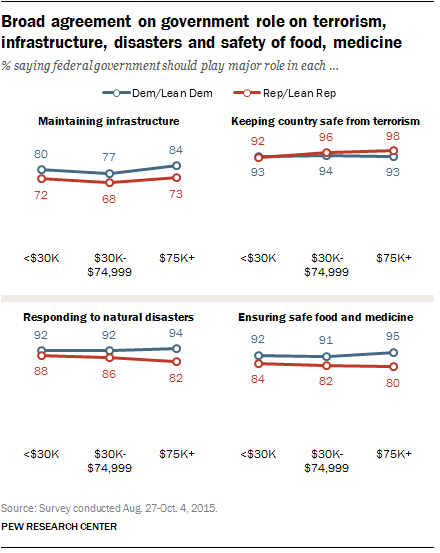 And while majorities among both higher- and lower-income Republicans want the government to have a major role in strengthening the economy, this view is more widely shared among those with incomes of $30,000 or less (74%) than among those with incomes of $75,000 or more (56%). On most of these issues, the views of middle-income Republicans and Republican leaners – those with family incomes of $30,000 to $75,000 – fall between those of higher- and lower-income Republicans. But in opinions about the government’s role in ensuring access to quality education, identical shares of Republicans with incomes of less than $30,000, and those with incomes of $30,000-$75,000, favor a major role (62% each). Only 42% of Republicans with higher incomes ($75,000 or more) want a major government role in this area. There is broad consensus – among members of both parties, regardless of income – for a strong government role in keeping the country safe from terrorism, maintaining roads, bridges and other infrastructure, responding to natural disasters and ensuring food and medicine safety. The survey asks about the federal government’s performance – as well as its role – in 13 separate areas. The differences among Republicans in views of government performance are far less pronounced than over the government’s role. And in some instances, the income differences among Democrats are about as large as those within the GOP. For instance, while there is widespread criticism of the government’s job in alleviating poverty, lower-income Republicans and Democrats give the government higher marks than do those with higher incomes. Nearly half of Democrats (46%) with family incomes of $30,000 or less say the government does well in helping people get out of poverty; 37% of those with incomes of $75,000 or more agree. Differences by income among Republicans are similar (36% among those with incomes of less than $30,000 say government does this well, vs. 26% among $75,000+). About four-in-ten Republicans (42%) with incomes of less than $30,000 say the government is doing a good job of strengthening the economy, compared with just 28% of Republicans making $75,000 or more. Among Democrats, the differences are more modest: 65% of those with lower incomes rate the government’s performance positively, as do 71% of those with higher incomes. 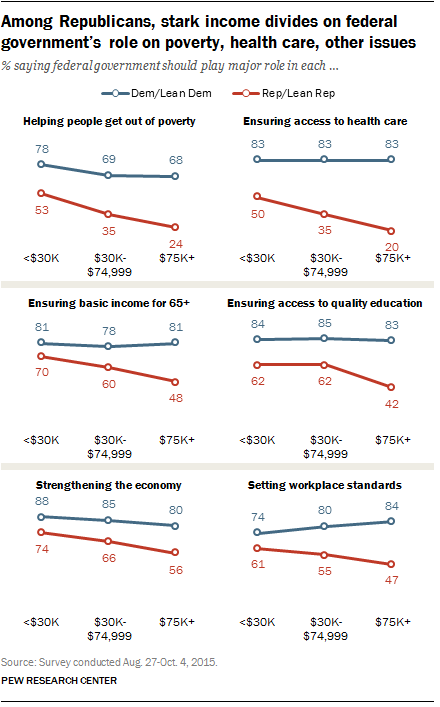 As past Pew Research Center surveys have found, lower-income adults are less likely to vote or participate in politics than those with higher incomes. This is the case among both Republicans and Democrats. The new survey on government attitudes finds that just 27% of Republicans and Republican leaners with annual incomes of less than $30,000 are politically engaged – that is, they say they are registered to vote, do so regularly and follow politics most of the time. Among middle-income Republicans, nearly half (47%) are politically engaged. And among those with incomes of at least $75,000 a year, 65% are politically engaged. The same pattern is evident among Democrats and Democratic leaners. About half (51%) of Democrats with annual incomes of $75,000 or more say they vote regularly and follow politics most of the time. That compares with just 21% of those with incomes of below $30,000. Note: For detailed views of government role and performance across all 13 issues by income, and income categories within each party, click here.